Roof Repair in Hialeah Florida is quite different than in other parts of the country. Hialeah extreme temperatures and very frequent hurricanes leave local roofs vulnerable to disrepair and very often ignored, roof leaks and compromises. Roof repair in Hialeah is sometimes as simple as Roof Tile replacement. Then again, it can be as heavy as an entire Roof replacement. The only way to know what is best for the roof is to get a reliable Roof Inspection. Hialeah Roof Repair provides their customers and perspective customers Free Roof Inspections to ensure the proper maintenance is performed. Leaving your roof in disrepair and exposed to the elements as pictured here only increases your chance of needing a complete roof replacement. Taking advantage of the Hialeah Roof Repair Free Roof Inspection policy will help to keep your repair bill to only exactly what is needed. 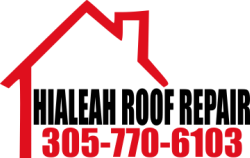 Call Hialeah Roof Repair today to get your roof Inspected and repaired.